Congrats on having a creamer card-cute name and cute kitty in the cute cap. Lots of cutes in this post!! Congrats Colleen! Totally deserved and Smoat is adorable. Our Lucy is 16 and used to be closer to that size, but she is getting showing signs of what I call 'little old lady bones' and is thinning out ... enjoy your trip and look forward to your creative return. Congratulations Colleen! This is beautiful. 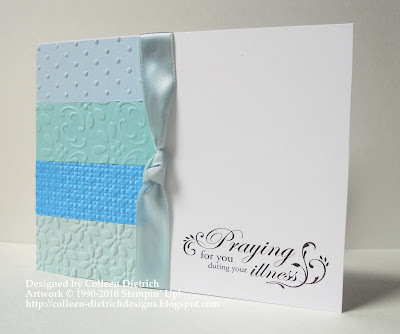 I love all the different embossed strips and the layout with the simple knot. Pretty Kitty! Ilove how you combined different textures and colour shades! Well I can certainly see why your card won. It's absolutely gorgeous. I love your colors and the different embossing patterns are just fantastic. Great work!